Young art historian May Gold is trapped in a dead-end college teaching job and a slowly failing love affair with an older professor. Yearning to fly free of job and dead-end relationship, she feels like a precocious failure. When the floor under the gilded dome of St Peter’s basilica rocks under her feet, May finds herself in the year 1624, staring straight into the eyes of her idol. But can she make a relationship with a man five hundred years in the past, in a brief hour or two at a time? And how do the folds of time part for her—is it simply by wishing to see him again, and does she leave him by doubting her ability to stay? Meanwhile, her elderly department head finds her own answers to the grief of losing a grown daughter when time unfolds for conversations with her artistic hero, Michelangelo, who recommends she adopt a mentee, and Eva considers her previously despised employee, May Gold. As the tour proceeds, May and Gianlorenzo grab brief, passionate moments together, but history says they have no future. Eva offer May the career path she has wished for, but perhaps too late. Can May find a way—and the courage—to give up everything, even the time in which she lives, to be with her soulmate? 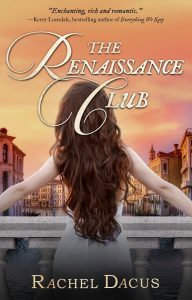 Rachel Dacus’ time travel novel, THE RENAISSANCE CLUB, was published in 2018. Magical realism runs through Dacus’ four collections of poetry, including her most recent, ARABESQUE. Earlier books are GODS OF WATER AND AIR, FEMME AU CHAPEAU, and EARTH LESSONS. Rachel has completed another magical realism novel, THE INVISIBLES. It’s the story of two half-sisters who clash over their inherited cottage on the coast of Italy, with its resident ghost, the poet Percy Bysshe Shelley. She lives in the San Francisco Area where she walks in the abundant open space, often following her Silky Terrier on a stretched lease, wishing she could bottle that energy. When not writing. she raises funds for art, education, healthcare, and other good causes.